Bladetricks products are extremely sharp tools and should only be used with the utmost care and caution. Always remember to sheath your blade when not in use. Keep out of reach of children. 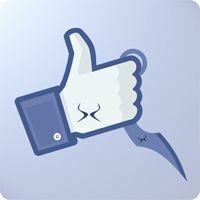 Bladetricks values your privacy. We do not share your information with any outside parties. 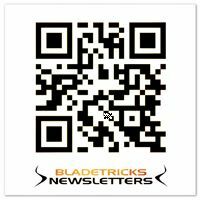 Please visit Bladetricks online store for all Bladetricks readily available products. 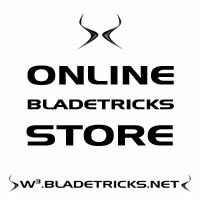 Bladetricks ships all orders on a first come/first served stock available basis. Bladetricks reserves the right to refuse business to anyone. For preorders and custom orders of any product we carry but don’t currently have in stock we require the payment of 50% of the total amount in advance to make it official. The remaining 50% must be paid when the preorder / custom order is ready and prior to the product being shipped to you, together with the shipping charges. Preorders and custom orders cannot be cancelled once the order is placed and the first payment (50%) has been made. If a special order has been made but the customer has not paid the final invoice for the remaining amount (50% plus shipping) within 30 days of receipt of the final invoice, the initial payment/payments are considered forfeited and the product may be sold to another customer. If the customer decides to not go through with the order once the knives or tools have been ordered from Bladetricks, the initial payment will be forfeited. We constantly try to improve our designs. Bladetricks reserves the right to modify the design and/or construction of any goods without notice and without incurring any obligation to furnish or install such alterations, changes or modifications on goods previously or subsequently sold. Bladetricks’ production runs may exhibit slight variations in size, color and material, but will not alter the overall intended use of the item. Manufacturing lead time for preorders and Custom orders is 2 - 6 months, though we can not guarantee a timeframe. We are happy to take your payment via PayPal for all orders (NO PAYPAL ACCOUNT REQUIRED). Prices do not include shipping charges from BLADETRICKS. By placing an order for items to be shipped, you are accepting our shipping estimate as the official shipping cost. All shipping fees must be collected prior to the item(s) shipping. We will only ship to confirmed addresses, as listed in the PayPal payment details, telephone number included. Customers placing orders to be shipped internationally take all responsibility for any customs and/or duties associated with their shipment. All shipments are inspected, checked and well packed before leaving Bladetricks. Any damage that occurs may be solely through negligence of the carrier. Bladetricks assumes no liability for loss of or damage to the goods after shipment has been picked up by the carrier and risk of loss with respect to the goods passes to the buyer. Unless otherwise agreed in writing by Bladetricks and the buyer, Bladetricks will have the sole and absolute discretion to select the method of shipment, routing of shipment and selection of carrier. Bladetricks warrants to the registered first buyer that our knives and tools are guaranteed free from defects in material and workmanship for the life of the knife or tool. This warranty covers replacement parts and labor. Bladetricks will inspect and make the final decision as to the cause of defect and whether to repair or replace any knife or tool. The warranty may not cover normal wear, material loss from blade or tool resharpening or attempted repair, damage caused by neglect, misuse, intentional abuse or the failure to perform normal or necessary maintenance, disassembly of any knife or tool by any person other than Bladetricks' staff (excluding simple handle changes), or shipping costs for returned knives or tools. Repair or replacement as provided under this warranty is the exclusive remedy of the first buyer, with Bladetricks reserving the right to make the final decision between the two. Bladetricks shall not be liable for any incidental, reliance, or consequential damages or breach of implied warranty on this product, including any damage to person or property. 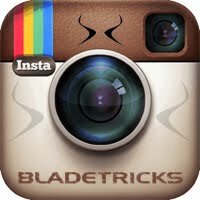 Bladetricks liability under any circumstances is limited to the original purchase price. INDIRECTLY ARISING FROM THE SALE, HANDLING OR USE OF ANY PRODUCTS. The purchase, use, and ownership of our knives and/or tools are subject to a wide variety of local laws and regulations. Certain knife styles, blade designs, lengths, tools and materials are not allowed in specific areas or to be possessed by certain people. Buyer and/or end user (Indemnitor) shall indemnify, defend, and hold harmless Bladetricks, its officers, officials, employees, and volunteers from and against any and all liability, claims, damage, cost, expenses, awards, fines, judgments, and attorney fees (including, without limitation, costs, attorney fees, expert witness fees, and other expenses of litigation) of every nature arising out of or in connection with buyer and/or end user’s performance, usage, transfer, sale or possession, or its failure to comply with any of its obligations contained in the agreement, except where such loss or damage which was caused by the sole negligence or willful misconduct of Bladetricks. Bladetricks assumes no responsability whatsover for any harm or injury resulting from the sale, trade, use or handling of any product purchased from us. It is the sole responsability of the buyer, not the seller, to ascertain and obey all applicable local, state, federal and international laws in regard to the possession or use of any purchased item. We are unable to provide refunds in the event that the package you have ordered was delayed and/or seized by customs or any other agency. Please consult your local and state laws before ordering if you are in doubt. All images and texts, design and designs, look & feel and logos are the property of Bladetricks and may not be copied, modified, reproduced, distributed or used without the written permission of Bladetricks. You should assume that everything you see or read on this site, E-mails or in our catalog is copyrighted unless otherwise noted and may not be used without the written permission of Bladetricks.